The entire trail is 21 miles start to finish. This 21-mile long paved multi-purpose trail runs from southeast Portland to Boring, OR and is part of the 40 Mile Loop that connects many of Portland's parks. A former rail corridor that has a history stretching back to the early 1900s, the trail is now used by runners, walkers, and cyclists. The Springwater Corridor is away from the road for the most part, which is a treat for road bikers who will get a break from looking out for cars during their ride. It is not only a good place to take a ride for exercise, but is also a very good way to get around town if you would like to avoid the road. It runs around the banks of the Willamette River in downtown Portland all the way to more rural areas outside of the city. 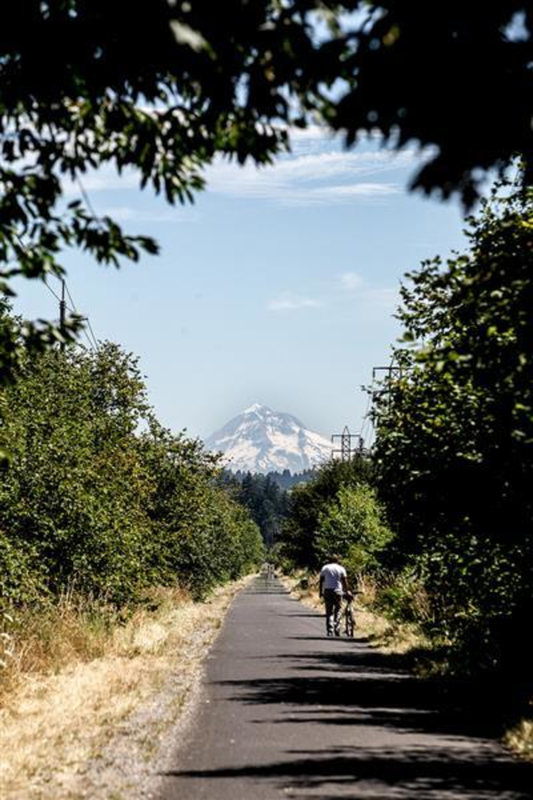 The trail connects to several parks including Powell Butte, Gresham’s Main City Park, Leach Botanical Garden, Oaks Bottom Wildlife Refuge and Tideman Johnson Nature Park. These parks include forested land, meadows, a variety of wildlife, interesting plant life, and open water. The corridor crosses over Johnson Creek over 10 times and after a few floods, the City of Portland protected some of these areas as natural areas and wildlife habitats, which makes for even better wildlife observations. There are many locations to access the trail, which also makes it easy to hop on from different areas of town. It's also a safe and easy way to get to downtown from several Southeast Portland neighborhoods and communities beyond, so the trail is crowded with bicycle commuters during rush hour. You can see a variety of landscapes from the trail, from industrial areas to parks and wetlands. The path extends from SE 4th Avenue to Ivon Street and is paved the whole way. There is a gap between 13th and 19th street, but can simply be connected by some roads in between. Because you would expect nothing less in Portland, there's also a food cart pod called Cartlandia located on the trail. Grab a coffee during your morning bike commute or stop by for a beer after an exhausting run! The path is fairly mild in terms of elevation gain and loss, which makes it accessible to people exercising at all experience levels. This is a multi-use path, so it is intended for cyclists, joggers, walkers, and even some occasional equestrian use, usually east of I-205. 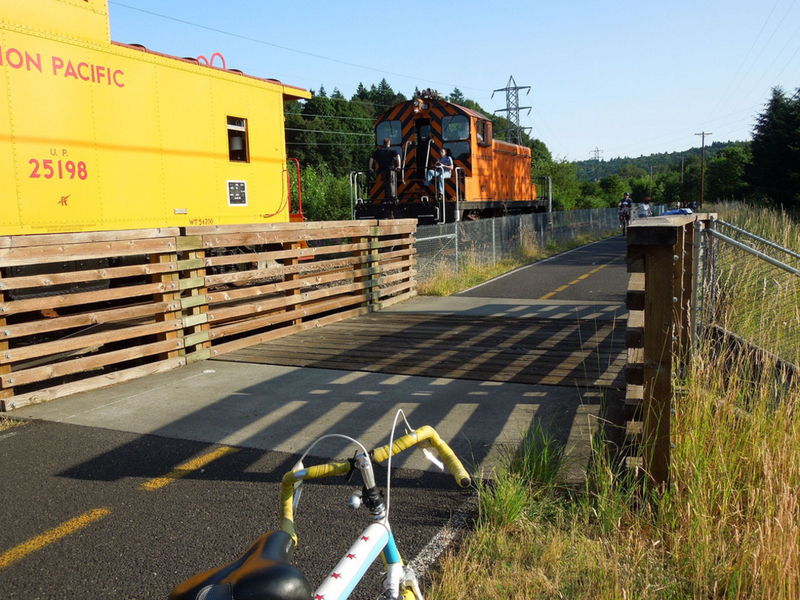 Because this path goes from downtown Portland to more rural areas outside of town, it is appealing to both those looking for a nice, long ride through some natural areas and those who want a safe and easy way to get around town. The path also intersects with the I-205 bike path. The combination of the two bike paths makes getting around the city even easier and safer. Because of it's location, there are several access points to jump on the trail. Check out the map for more information.